The best thing about every tattoo is that it has a story to tell. You never just walk into a tattoo parlor and get the image of a person, god or some sacred words inscribed on your body forever. 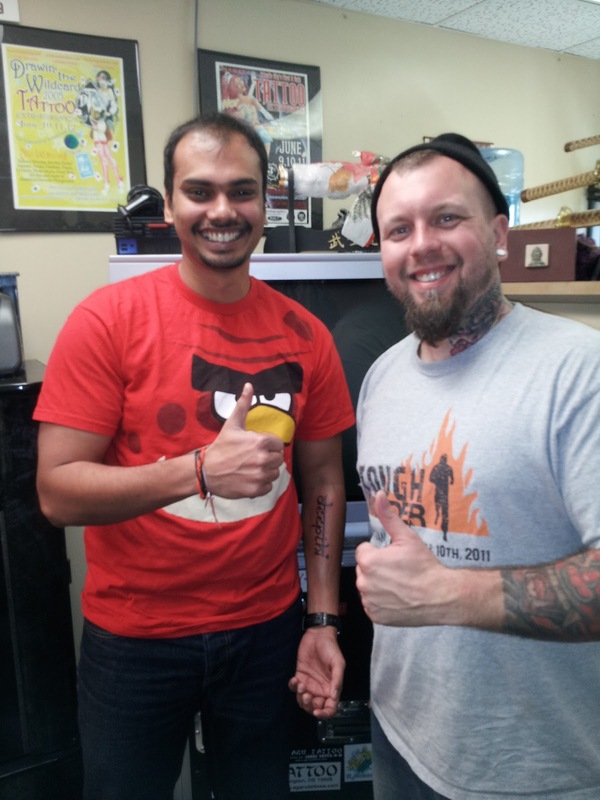 And neither can you make your mind after a few hours of window shopping session and get yourself inked. But having said that still a big majority amongst us have their own inhibition towards tattoos. And that too even after all that thought process Tattoo is still a big Taboo in our society. 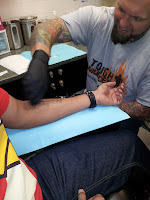 Tattoos make people apprehensive and some avoid it thinking about the excruciating pain one has to go through. Personally I am a big aficionado on Tattoo as an art. I would just stare at that girl for an extra minute (wink) who dons a tattoo on her. Yes, definitely a turn on. But at the same time hate those few who have inked each and every part of their body. I guess anything over the limit makes it that ineffective. Anyhow, I made this epic decision to get myself a tattoo somewhere in biceps or forearms. And my researches were primarily on Hindu Gods, Sanskrit verses, Chinese symbols etc. But later I found out that , the ever picky grumpy me started hating each design. And more over some of the designs did not make any sense to me personally. Though they were fantastic designs to show off but at a personal level of intimacy they fired blanks.And that is where I zeroed down into my wife's name on my forearm. Once I finalized that, the easier part was to find a proper literal to depict her name. Luckily there are umpteen websites which provide such creative art forms. And with little bit of my inner creativity I drew out this particular design. Yes!! Now I could say its something I relate to and I am a big part of. The toughest part was to hide this whole plan from my wife. She knew am a big tattoo buff. But never ever will she agree her name on my hand. With all this in my mind I walked into Agaru Tattoos here in Wilmington , Delaware. Ok, the big question is how would you pick a tattoo parlor? Well the simplest answer is research. A simple search in google will provide you the nearest tattoo centers. Make sure you go through their previous work, awards & recognition's are always better, reviews from previous customers always provide you their line of work. And fire a few questions to the tattoo parlor, their specific answer will help you decide. It definitely helped me. Tommy from Agaru responded to my query on design, proposed cost, slot availability etc. On Nov 17th 2012 around 12 noon I walked into Agaru. All in all it was a cherished experience as the Agaru crew helped me get pass the initial jitters and get into the job right away. Filled up some forms and submitted my proof of ID. All set to walk into Tommy's Clinic or Pod as they call it. As you can see from the pics below, its an interesting art form. Tommy even got one of his colleague to take our pictures at regular intervals. To ease my tensions, he kept engaging in some interesting conversations as well. Any Pain?? Hmm a pain somewhere in between a 'mosquito bite' and 'honey bee sting'. That's best is how I can relate to it. And as some have asked me already 'There are 'NO pain killer Injections\Tablets' involved in this whole episode. Its a walk in the park compared to many other things that we go through. And for under $100 we wrapped this thing up completely (Yeah my Indian genes made sure I bargain even the last dollar) . A few tattoo maintenance instructions on how to take care the tattoo and I am all done here. To all those people interested in getting a tattoo done, don't wait any longer. Your post is a pretty good one. Do you have any tips on how I should prepare myself mentally and physically, before I go to tattoo shops in Denver? I think I'm ready, but I'm still a bit worried about getting a tattoo. Mental preparation is the toughest part. I had a tough time convincing me on the design and reaction from my family. So if you have your design finalized, everything should be easy. Physically, nothing much. Its like going to Starbucks, just walk in and get it done. Congrats Shabbu! 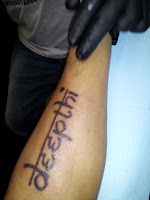 By the way, in December 2012, even I have tattooed my wife's name (4'' x 1.5'') on my left forearm. It's a great feeling - for me & my wife!! Cheers!! Congrats Shabbu! By the way, on 25th December 2012, even I have tattooed my wife's name (4'' x 1.5'') on my left forearm. It's a great feeling - for me & my wife!! Cheers! !